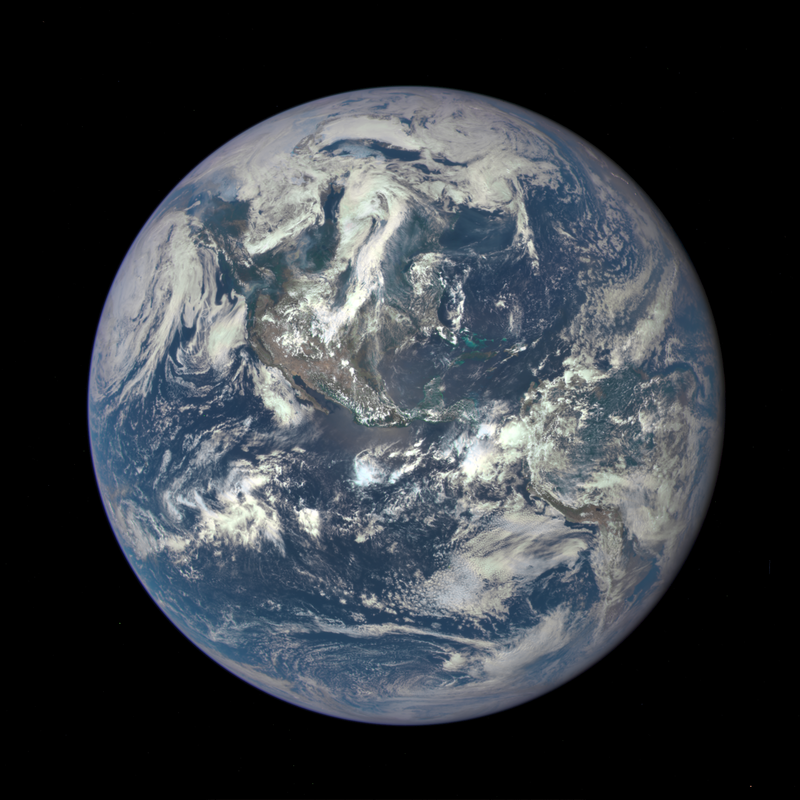 A NASA camera on the Deep Space Climate Observatory (DSCOVR) satellite has returned its first view of the entire sunlit side of Earth from one million miles away. This color image of Earth was taken by NASA’s Earth Polychromatic Imaging Camera (EPIC), a four megapixel CCD camera and telescope. The image was generated by combining three separate images to create a photographic-quality image. The camera takes a series of 10 images using different narrowband filters — from ultraviolet to near infrared — to produce a variety of science products. The red, green and blue channel images are used in these color images. The image was taken July 6, 2015, showing North and Central America. The central turquoise areas are shallow seas around the Caribbean islands. This Earth image shows the effects of sunlight scattered by air molecules, giving the image a characteristic bluish tint. The EPIC team is working to remove this atmospheric effect from subsequent images. Once the instrument begins regular data acquisition, EPIC will provide a daily series of Earth images allowing for the first time study of daily variations over the entire globe. These images, available 12 to 36 hours after they are acquired, will be posted to a dedicated web page by September 2015. The primary objective of DSCOVR, a partnership between NASA, the National Oceanic and Atmospheric Administration (NOAA) and the U.S. Air Force, is to maintain the nation’s real-time solar wind monitoring capabilities, which are critical to the accuracy and lead time of space weather alerts and forecasts from NOAA. Links: NASA press release, DSCOVR homepage. On February 11, the United States Air Force launched a National Oceanic and Atmospheric Administration (NOAA) satellite called Deep Space Climate Observatory, or DSCOVR, into orbit. NOAA will use DSCOVR to monitor the solar wind and forecast space weather at Earth — effects from the material and energy from the Sun that can impact our satellites and technological infrastructure on Earth. Data from DSCOVR, coupled with a new forecast model, will enable NOAA forecasters to predict geomagnetic storm magnitude on a regional basis. Geomagnetic storms occur when plasma and magnetic fields streaming from the Sun impact Earth’s magnetic field. Large magnetic eruptions from the sun have the potential to bring major disruptions to power grids, aviation, telecommunications, and GPS systems. The DSCOVR mission is a partnership between NOAA, NASA, and the U.S. Air Force. In addition to space weather-monitoring instruments, DSCOVR is carrying two NASA Earth-observing instruments that will gather a range of measurements from ozone and aerosol amounts, to changes in Earth’s radiation. Links: original NOAA press release; NY Times article about the launch, DSCOVR home.